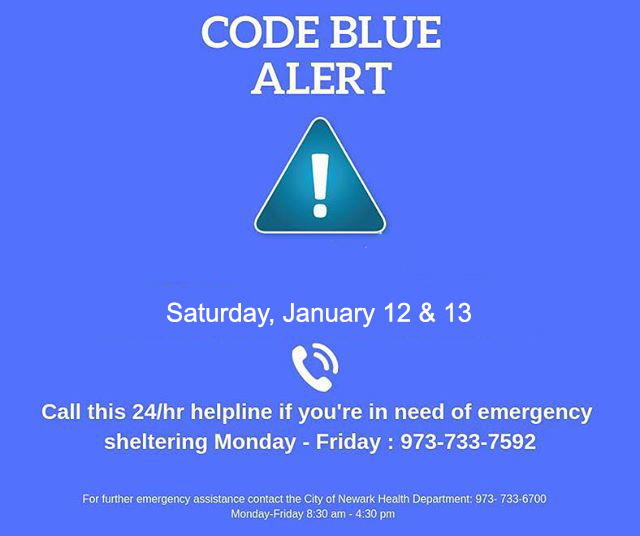 Mayor Ras J. Baraka and Department of Health and Community Wellness Director Dr. Mark Wade activated “Code Blue” for this week and into the weekend. Code Blue is called when temperatures reach 25°F or lower without precipitation or 32°F or lower with precipitation. “We are expected to endure temperatures as low as 20°F with a wind chill of 9°F and residents should take measures to ensure their safety at home and when outside of their home,” said Director Dr. Wade. The City would also like to remind residents that there are a number of homeless shelters operating during the extreme cold weather including for Code Blue sheltering. For more information about sheltering services, contact the shelters listed below or any of the other homeless shelters in the City of Newark. For more information, you can contact the Division of Social/Homeless Services at (973) 877– 9484, Monday through Friday, 8:30 a.m. to 4:30 p.m. or call (609) 439 - 5210 after regular business hours. ** No beds available at this time.